Tasmania’s east coast is many different things. Yes, it’s picture-perfect, white sand beaches and open, endless blue horizons. It’s places that make you feel like you’re the first person to leave a footprint. It’s national parks filled with wonders, and seaside towns filled with welcome. It’s a gourmet food bowl bursting with the best local fare. But it’s much more than that. Here, you can experience one of Australia’s greatest road trips—the Great Eastern Drive. This is a journey that will lead you to places and moments that you’ll never forget. From those famous beaches, to luscious food and wine, award-winning walks, and views that will take your breath away. Tasmania’s east coast is a place of stories, encounters and treasures. A place where small, unexpected moments become lifelong memories and where taking a break can not only refresh, but reinvent. Once you visit, you’ll understand. And once you understand, we promise, you’ll want to come back. Again. And again. Tasmania’s east coast has some of the state’s most diverse and captivating national parks. 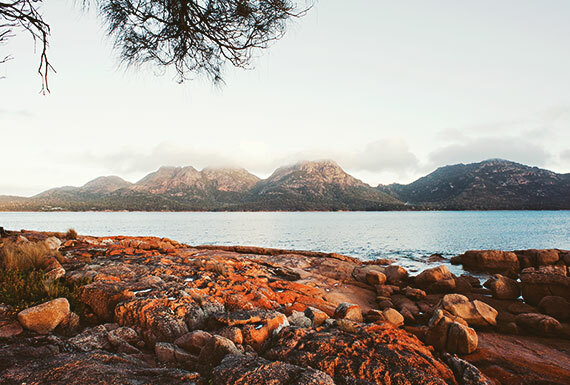 Take your time to discover the World Heritage-listed cultural sites of Maria Island, walk the famous white beaches of Freycinet, explore the protected forests of Douglas Apsley, or experience the coastal heaths and abundant wildlife of Mt William.